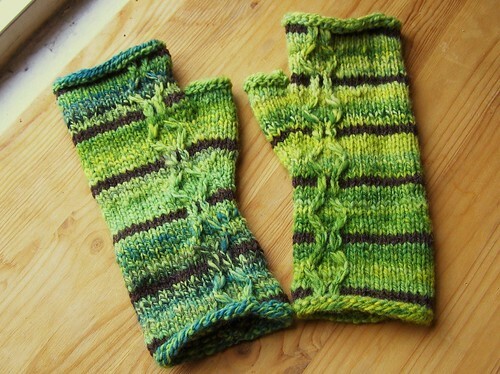 Striped fingerless mitts with stalks of faux cables and slipped stitches traveling up the hand near the thumb. Sizes: xs(s, m, l), to fit around a 7.5(8, 8.5, 9) in. [19(20.3, 21.6, 23) cm)] hand – If you like a more fitted mitt, go down one size. Note that these are sized for men’s hands, for women’s sizes, work at a smaller gauge. This entry was posted in cosyknitsliterally, cosyspins, handspun, knitting, mittens, patterns, spinning by cosymakes. Bookmark the permalink. So cute!! I love these. Simple but with impact.